What could be nicer than waking up in the morning and immediately feeling the fresh mountain air with the mist still hovering around and over the surface of a lake. Not having to dress quickly and go down in a lift to breakfast, queue to use the toaster and coffee machine or wait for a waiter to get around to you in a room full of other sleepy people not wanting to miss breakfast. But to make your own food and sit for as long as you like and gaze out over the amazing views, still in your jimjams if you feel like it. That is the first free choice of your day and just one that the freedom of a camping holiday gives you. Camping bled in Slovenia must be one of the best experiences possible because the surroundings are so breathtaking. The Bled castle overlooks the tranquil lake undisturbed by any sort of annoying buzz of motorboats or jet skis, strictly forbidden on Bled lake. The Julian and Karavanke Alps with snowcapped summits, deep ravines and gorges, lush forest and green meadows and countryside attract countless artists to try and capture the beauty on canvas or film. The facilities in camping bled are excellent. There are spacious sites to pitch your tent or for caravans and camper-vans. Included in the price you have 5 state-of-the-art sanitary blocks with showers and hot water, 2 heated out of season and facilities with washing machines and dryers. For the kids there is a well equipped play area and a petting zoo. For the older kids, including adults there is beach volleyball, table tennis, badminton and basketball courts, billiards, trampolines and video games. Wifi internet is available but only near the reception area not on individual sites as the signal is not strong enough. There is a well stocked mini market in camping bled and a restaurant for those not wanting to cook on a camping stove. An alternative choice in camping bled if you feel you do not to rough it in a tent but still want the feel of it there is glamping…..the tent shaped ‘huts’ are made from larch and covered with larch shingles and are on an elevated area further back on the camping bled site. These sleep 2 people and are well equipped with 2 beds with mattresses, pillows and blankets, towels and bathrobes. They have electricity hook-up for mobile phone chargers or laptops and are heated. All have wooden garden furniture, table, chairs and 2 deck chairs. For a little extra luxury some have an outside hot-tub to relax in at night and do some stargazing. 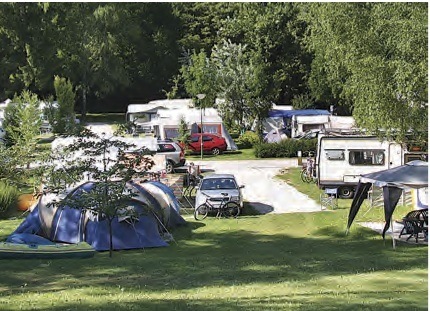 The camping bled lakeside beach is just 100 metres from the site entrance with a swimming area and boat hire. Have a swim then row or paddle around on the lake and explore. In the centre of lake bled is the only island in all Slovenia, this picturesque island can only be reached by boat and once there the climb to the top can be rewarded by a ring on the bell said to grant a wish. The activities to be taken around Bled are endless, peaceful fishing or canoeing on the lake, walks around the lake or in the wonderful countryside, cycling on the many paths and tracks. Sot the more energetic there is white water rafting, canyoning, mountainbiking, mountain climbing, hot air ballooning, paragliding, and in the winter skiing.Yes you can also camp in winter in camping bled!